May 2015 In my AA Editorial Services capacity I’ve recently been working with another client of Outset Swindon on web copy, press releases and marketing letters. My client’s business is called High Street Hero, the thrust of which is to give a superpower, or same-day delivery service, to independent retailers allowing them to offer a service that sets them apart on the high street. When the client and I were working on the web copy we talked a lot about the whole shop local initiative and how it fits in with what he is trying to achieve. Everyone wants a vibrant high street that is a place for socialising as well as shopping. But that doesn’t happen by magic. We all have the choice between using independent retailers and food outlets or the national and global ‘big -boys’. Sometimes one has to go to the ‘big-boys’ – but if we always do that then we’ve only ourselves to blame for high streets full of pound stores and charity shops. 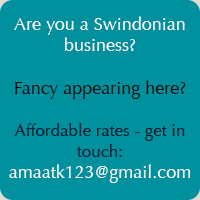 So of late I’ve been trying to shop locally myself where ever possible and use Swindon’s many independent coffee shops every chance I get. In recent months I’ve bought gifts from Catherine Jay and Pink & Green – two start-up artisan businesses that I’ve met via Outset Swindon – and even, to get to the main focus of this blog post – Da Paolo’s Eatalian delicatessen on Commercial Road in Swindon. As well as being a lovely deli from where I purchase luscious olives and tasty cheeses among other things, they also serve the most delicious coffee and at a fantastic price – I visit quite a lot for that alone! I have mentioned the place before in an overview post of Swindon’s coffee scene but doing the research on shopping locally prompted me to put this post together as Da Paolo’s is an embodiment of many of the espoused benefits of supporting independents. You get specialist knowledge of their goods and you get personal service and a relaxed shopping experience. And you can even have a coffee while you do it. This past Christmas I decided to purchase a hamper of Italian goodies as a gift for a friend. So, with delicious coffee in hand, together with Debbie (partner of Paolo) I selected an assortment of goodies to fit my budget. Then, shortly before Christmas, I collected my hamper all beautifully arranged and packaged with red ribbon. Now THAT’S what I call shopping. One of the many benefits of shopping locally is that our custom enables the businesses that we patronise to support the community in which they are based in various ways. Darkroom Espresso, one of Swindon’s fabulous independent coffee shops for example, supports local artists by holding exhibitions of their work. Da Paolo’s does what it can for charity. Its current charity of choice is Brighter Futures: http://www.gwh.nhs.uk/support-us/about-brighter-futures/ which which supports the staff, patients and families of Great Western Hospital and community health services across Wiltshire. So if the fab coffee and the delicious Italian groceries are not good enough reasons in themselves to hot foot it to Da Paolo’s then this surely is? It’s a funny old thing really. When I first came to Swindon – about twenty years ago – I used to bemoan the fact that eating choices here were largely limited to curry houses and Italian restaurants. In recent years that’s most certainly changed. Not only can Swindon proudly boast numerous independent coffee shops there are some great independent restaurants too such as Rio – the Brazilian place – my favourite Eggelicious and my favourite curry house (so far), Rangoli. And there are quite a few more worthy of your time and attention. But to return to the subject of curry. My Indian born son-in-law has often complained about the lack of actual Indian restaurants – given that most curry houses in most places are actually Bangladeshi establishments. Now, I’m not saying there’s anything wrong with Bangladeshi food. Heaven forfend! It’s perfectly delicious and I’ve eaten my body weight and more in it over the years. It’s just that it’s not Indian. So when we discovered Rangoli – oh my – the smile on his face was wider than that of the Cheshire Cat. He was thrilled. And now in Swindon we have another restaurant of the actual Indian variety by the name of Pappadams down on Regent Circus – in what was La Dolce Vita. I was fortunate enough to attend the official opening a few days back and below are a few photographs of the occasion. It was a sparkling event in every way. There was a drop or two of very nice Prosecco, (and failing the presence of Bollinger I like a drop of Prosecco), a trio of tiaras, and an MP of the town. I’ve been trying to think of a good collective noun for the tiaras. A ‘glitter’ or a ‘shimmer’ perhaps? Madame Mayor was also present to cut the ribbon – the second time in a few days I’ve bumped into the lovely lady – the first being at the official opening of Bunny Pumpkins and the Emporium of Loveliness. I’m not following her – honest! Anyway, I wish Pappadams every success and look forward to trying the place out ‘properly’ before too long. The coffee shop is located down on Faringdon Rd. It’s a sizeable place having plenty of room for a pushchair or a bike. I really like the style of the place – it’s sort of pared back and stripped down yet still has a cosy feel to it with clever use of lighting and plants. No mean feat that. The young couple who own and run it are very lovely and friendly. I went in with a friend on their first day of opening and they gave us a particular kind of coffee to sample. Now I rejected this sample immediately as it had liquorice notes to it – and liquorice is one of the few things I absolutely can’t abide. Along with aniseed. *shudders*. Years ago I recall seeing boiled sweets made of both those things. Really? Why? Anyway, interestingly my friend could not detect the liquorice at all. Andy (I think that’s his name) was telling us they hope to get some papers in (kind of litmus papers I suppose but for tasting) that one puts on the tongue so see what sort of taste buds one has and what flavours one is most likely to pick up. Which would be interesting. I’m sure they could explain the concept much better. Beyond a croissant I haven’t eaten anything in here as yet so can’t comment personally on the sandwiches and what not on offer but I see favourable comments on social media. Nor do I drink anything other than black coffee – and that’s good – so again can’t comment on any of the other varieties of hot drinks. The only gripe I have about this cafe, and it’s an age and a personal thing, is that all the seats are hard – and I’m a big fan of some cushioning in a place. 😉 As uber cool as old church pews and wooden stools and all the rest of it are – they aren’t very comfortable. 😦 The cafe has this fab white-painted table in the window and I love that spot cos it’s light and airy and you can watch the world go by. But oh those stools are hard on the posterior and the spine! But hey – this is just my personal view and other than that I like it very much. So all power to their coffee cup! But if they could see their way to installing a comfy chair or two…. But lack of cushions and comfy chairs apart at least I didn’t notice any unfortunate grammatical/spelling/punctuation errors around the place as happens all too often. I’ve always been a tad irritated by such things but, since leaving university and starting my proofreading business, AA Editorial Services, I’ve started to get even more attuned to erroneous apostrophes or even worse, missing apostrophes! It’s enough to put one off one’s Cafe Noir for sure. … not in Brazil but here in Swindon it seems. There’s bean (see what I did there?) a fair amount of coverage in the local media recently about the number of coffee shops appearing in Swindon. There’s certainly a plethora of Costa outlets. Don’t get me wrong, I’ve nothing against Costa and do use them – though I don’t think the coffee is as good as it was when they first appeared on our High Streets – but they’ve sure as hell become ubiquitous. I’m even partial to a McDonald’s coffee if that’s what’s on offer – it’s really not at all bad. But wherever possible I’d rather support an independent. And in such establishments Swindon is especially blessed. My absolute fave in the town centre for years now has been the Piri Piri on Havelock Street. Now this place has recently changed hands and name and is now called Luso Cafe. It’s still Portuguese and the coffee is still damn good but I’m not entirely sure it’s quite as good as it was. But don’t take my word for it – do try it yourself. I’m also sad that the wonderful Portuguese tapas are no longer available. It seems to be more main meals at lunchtime and that’s it. 😦 However, everything is a trade-off is it not and the place has had a lovely piff-up and I won’t deny it needed it. It now looks so much smarter. AND there’s a bigger choice of cakes available – not just the Natas – AND they do the Portuguese bread roll thing stuffed with chorizo which I love. Plus the prices are very reasonable. A large black Americano is £1.80 and a Natas is £1.20. Jolly good value indeed methinks. Another favourite of mine when I’m over near the Outlet Centre is the 2Wins on Rodbourne Road. Another Portuguese establishment, this place has a wonderful selection of home-made (not bought in) Portugues baked goods. It’s worth making the effort to get to. Currently creating a stir in Old Town is the groovy and hipster Baila Coffee and Vinyl and now we have the newest kid on the block Dark Room Espresso on Faringdon Rd. I haven’t as yet done a proper blog post about them but below are a few photos to give you a flavour. The couple running it are very lovely and I wish them every success. But of course there are many,many more. Cafe Gusto and Cafe Art in Old Town both have their charms. As do them all and no doubt you’ve all got your own favourites. So here’s to your coffee cup! May they all flourish and keep Swindon’s ever growing coffee scene full of beans! Yesterday I was out and about roaming around town and Old Town . I’d walked into town from home, a good hour’s walk, so was ready for a cup of coffee by the time I got there. Having heard from a friend that da Paolo Italian delicatessen on Commercial Rd did a good coffee I decided to head there and give it a go. She wasn’t wrong. Now as the name implies this place isn’t a cafe or a coffee shop but an Italian delicatessen selling all sorts of wonderful things. I bought a lovely roll there to take away with me which was stuffed with Parma ham and sun dried tomatoes and lots of splendid things. But as an extra service they do coffee. There’s a little table out on the pavement – okay it’s Commercial Rd not Brussesls but hey – so I sat there with a VERY nice coffee and two delicious little pastry things – see the pictures below – for £1.70. For everything. Yes listeners you heard that correctly. £1.70. So that was £1 for the coffee and £0.70 for the two sweet titbits. Is that great value or is that great value? I am in awe. 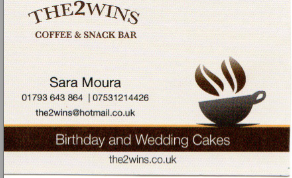 I’m talking about ‘THE2WINS’ – a coffee shop and snack bar in Rodbourne, situated little more than a spit from the front entrance of the Outlet Village. A Portuguese chap, to whom I give English lessons, told me about it. So today, having cause to go to the Outlet Village, I had an ideal opportunity to pop in. I didn’t have much time, so opted to just have my usual black coffee and a Portuguese sponge cake both of which were lovely and very reasonably priced at under £3 for both. I’m not often in that area of town but the next time I am, I will definitely go in again. It’s good to know there’s somewhere close to the Outlet Village where there’s good coffee, cakes and hot snacks other than Costa lotta. If you go to the Outlet Centre regularly then why not give it a try? It’s the briefest of detours from the front area and, I think, worth the little extra effort. Since initially writing this post I’ve been back here a few times and have discovered they also do some scrummy homemade rolls stuffed with chorizo. Nom, nom, nom. Reasons to be cheerful…. Update – 14th November 2014 – For the first time in ages I’ve been to The 2Wins and enjoyed the lovely bread roll they do stuffed with chorizo and a can of that soft drink I can never pronounce and that is the only soft drink I can tolerate – I’m not generally a fan of pop! So just a few pics to freshen up this post. The owners of the cafe now also have a little supermarket selling Portguese goodies just two doors down.